A genre version of the annual Austin 48 Hour Film Project, the 48 Hour Film Science Fiction Project required 13 competing teams to produce a short film within a two-day period in October. Austin was the only U.S. city this year to choose sci-fi over horror (the only other city in the world to follow Austin's lead was Geneva, Switzerland). The contest's required elements included the character Shawn or Sherri McDonald, a mechanic; a toy animal prop; and the line, “Your place or mine?” The premiere screening of this year’s 48 Hour Film Science Fiction Project entries will be held 6 p.m. Nov. 6 at the Lake Creek 7. 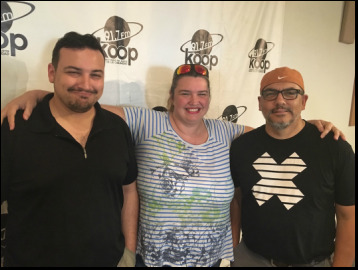 48 Hour Film Science Fiction Project contestants Aaron Arizpe (left; Team E|H Films) and David Avila (right; Team 3D Distributed) join 48 Hour Film Project Austin City Producer Alyne Harding (center) during this interview.